So apparently, Barack Obama is going for some visual reminder that he is presidential. 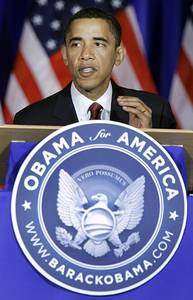 He's had his team craft an "Obama for America" seal, that reminds some of the presidential seal. I recall when we went to the National Archives in April, there was an exhibit for kids to create their own seal. It was kind of cute. Maybe Obama was there too. Maybe that's where he got the idea. Of course, Obama's not the first to take some flak for this. The Next Right - in a post designed to hurt Obama on this issue - points out that John McCain used an actual flag on his bumper stickers in 2000. Gasp. and in 2004, Kerry used something that looked a lot like a flag. OMG! I must say, I find it funny. First Obama is attacked for not wearing a flag ... thereby being unpatriotic. Now he's TOO patriotic? I'm not really sure what the argument is here, but it's certainly interesting. My take? The seal is a bit odd. Maybe presumptuous. But that's not the reason I'm not voting for Obama.